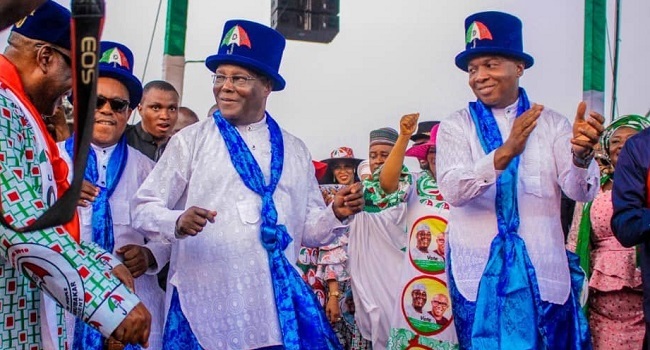 Condemning the Peoples Democratic Party (PDP), he continued: "My comrades, if you marry a woman for 16 years, no pikin, and even your brothers and sisters are dying and they say she's a witch, and you divorce her; you marry another one, and in three and a half years, "he" delivers on rail, power, giving Trader Moni, giving pensioners money, paying Biafran pensioners that have been forgotten, doing N-Power, creating jobs, infrastructure, why will any man or woman suggest the old [party] that for 16 years delivered poverty, corruption, mismanagement; why will you bring them back?" Mr Isa-Onilu said the APC does not own the Abuja venue, "so there is no way we could have denied them access to a place we don't own and we don't have control over". Deputy Coordinator, Field Operations, Presidential Campaign Council Kwara State, Kayode Oyin-Zubair, commended President Buhari in a statement issued in Ilorin yesterday. The News Agency of Nigeria (NAN) reports that Buhari and his entourage landed at the Presidential Wing of the Murtala Mohammed Airport, Lagos, at 10.13 a.m. on Saturday amid tight security. He will do well to tell us, why he mobilised his colleagues to deny them representation in government.